Speaker of the House John Boehner (R-OH), first elected to Congress in 1990 and Speaker since 2010, announced on September 25 that he is resigning his seat and leaving Congress on October 30. His departure is not expected to have an immediate effect on ESEA—if anything, it could prove a shot in the arm to the ongoing effort to craft a final bill. ESEA is part of Boehner’s legacy. As chairman of the House Education and the Workforce Committee, he played a key role in the 2002 rewrite that became No Child Left Behind. It is not yet clear how the fight for leadership of the House will play out or whether, like Boehner, the next Speaker will come from the GOP’s governing wing. Congress is moving at a glacial pace toward a short-term agreement to keep the government open, but it is unclear whether it can be completed before October 1 when the new fiscal year starts and funding runs out. On the evening of Monday, September 28, the Senate will take the first procedural step toward passing a “clean” bill to fund the government until December 11. While the House now also plans to take up a clean funding bill, it is by no means certain that the measure will reach President Obama before the clock runs out at midnight. Once the shutdown saga is behind us, NEA will continue to urge Congress to reach a bipartisan budget deal that avoids a full-year continuing resolution; raises the sequester-level funding caps; and provides relief equally to non-defense programs, like education, and defense programs.The funding caps must be lifted toallow for increased investments in formula-grant programs that target the students most in need—like Title I, IDEA, and Head Start. Click on the “take action” button and tell Congress to make a budget deal that lifts the funding caps. The clock is ticking. School is well underway across the nation, yet Congress keeps running in place— dithering over another potential shutdown instead of doing its job, which includescompleting action on ESEA. It’s time for Congress to get moving and for all of us to make ourselves heard—again. We can’t let Congress get as close to the next ESEA as a conference committee, and then fail to move a good bill forward. Lift your voices. Click on the “take action” button and tell Congress to stay focused on finishing an ESEA bill that provides more opportunity for all students, regardless of zip code. House Republican freshmen Ryan Costello (PA), Elise Stefanik (NY), Mimi Walters (CA), Daniel Donovan (NY), John Katko (NY), Carlos Curbelo (FL), Amata Radewagen (American Samoa), Cresent Hardy (NV), Bruce Poliquin (ME), Martha McSally (AZ), and Tom MacArther (NJ) for their “Dear Colleague” urging fellow GOP lawmakers to avoid another government shutdown. With less than two weeks to go before the start of the new fiscal year on Oct. 1, another government shutdown—the second in three years—remains a possibility despite the public opposition of congressional leaders from both parties. The main sticking point is a fight within the Republican caucus over policy issues unrelated to FY2016 funding levels. With just a few legislative days remaining, neither the House nor the Senate has brought forward even a short-term funding bill to keep the government running. 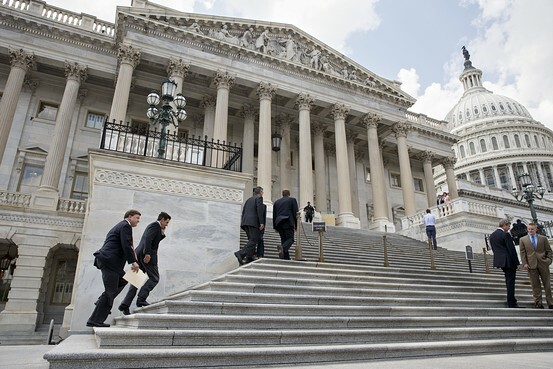 The current drama presages a bigger fight later this fall over a longer-term budget deal. As part of a broad-based coalition, NEA continues to advocate for lifting the sequester-level funding caps and providing relief equally to non-defense programs, like education, and defense programs—the approach that produced a bipartisan budget deal two years ago. We also will strongly oppose any effort to pass a year-long continuing resolution that keeps the caps in place, which could result in across-the-board cuts. The funding caps must be lifted to allow for increased investments in formula-grant programs that target the students most in need—like Title I, IDEA, and Head Start. Click on the “take action” button and tell Congress to make a budget deal. On Sept. 17, the House Committee on Ways and Means approved the NEA-supported Educator Tax Relief Act of 2015 (H.R. 2940), which would make the educator tax deduction permanent and, for the first time, index it to inflation and allow educators to deduct out-of-pocket expenditures for professional development as well as classroom supplies. The bill is part of a larger package that includes corporate tax breaks NEA does not support—they could divert resources from much-needed investments in public education, especially for the students most in need. Final action is likely later this year. First introduced in 2002, the educator tax deduction can cut your tax bill by $250 per year ($500 if your spouse is also an educator and you file jointly). No need to itemize to get this tax break—you simply deduct eligible expenditures from your overall income by completing line 23 of Form 1040 or line 16 of Form 1040A, according to the Internal Revenue Service. House and Senate members and staff are working behind the scenes to resolve differences in their respective rewrites of ESEA, S. 1177 and H.R. 5. A formal conference committee will convene later this fall. Click on the “take action” button and tell Congress to stay focused on finishing ESEA because students can’t wait any longer—the next ESEA must do more to fulfill America’s promise of equal opportunity for all. The Senate Agriculture Committee postponed the markup of the child nutrition reauthorization bill that had been scheduled for last week. Action is still possible this fall. The Education Insider will keep you posted on further developments. Senators Dean Heller (R-NV) and Martin Heinrich (D-NM) for introducing a bill that would repeal the Affordable Care Act’s 40 percent excise tax on the portion of health insurance premiums above specified thresholds, scheduled to take effect in 2018. Senator Ted Cruz (R-TX) for raising the specter of filibustering a short-term funding bill (to keep the government open) due to disagreements over controversial policy riders. Congress returned this week to a busy fall. Looming issues include debate on the Iran deal, funding to keep the government open, a bill to keep highway projects from stalling, raising the nation’s debt ceiling and, oh yes, completing action on ESEA! Education committee staff met during the August recess to begin ironing out differences between the ESEA bills passed by the Senate and the House. Despite a crowded congressional calendar, members of Congress need to be reminded that replacing thebroken system under No Child Left Behind must be a priority this fall. Click on the “take action” button and tell Congress thatstudents can’t wait any longer—the next ESEA must do more to fulfill America’s promise of equal opportunity for all. Without a budget deal, the federal government will shut down Oct. 1. The most likely outcome to the current stalemate is a continuing resolution that runs through November or December. As part of a broad-based coalition, NEA continues to advocate for lifting the sequester-level caps and providing relief equally to non-defense programs, like education, and defense programs—the only politically feasible solution, much as it was in the agreement reached two years ago. Lifting the funding caps is necessary to provide greater investments in formula-grant programs that target the students most in need—like Title I, IDEA, and Head Start. Click on the “take action” button and tell Congress it’s time to make a deal. The Senate Agriculture Committee is tentatively scheduled to mark up a child nutrition reauthorization bill on Thursday, Sept. 17. Child nutrition programs include school lunch and breakfast, as well as out-of-school-time feeding programs. NEA members fully understand the link between healthy, well-nourished children and student success. Click on the “take action” button and tell Congress to protect the guidelines for healthy school meals, improve training for school food service professionals, and strengthen programs that help kids eat when school is out. Reps. Chris Van Hollen (D-MD, Nita Lowey (D-NY), Rosa DeLauro (D-CT), and Barbara Lee (D-CA) for introducing the Prevent a Government Shutdown Act of 2015, which would lift the sequester-level funding caps and pave the way for a budget deal. They also headlined an event this week with an NEA-supported coalition of hundreds of organizations urging that the funding caps be raised. Agriculture Secretary Tom Vilsack for urging Congress this week to reauthorize child nutrition programs and prevent any walking back of nutrition standards that promote healthier eating habits for students. The House “Freedom” Caucus, a group within the House GOP, that continues to push for controversial policy riders on a short-term funding bill that raise the chances of a government shutdown.